What can be more romantic than proposing to the love of your life? What else can spell “love” like sealing forever with an engagement ring before her eyes? 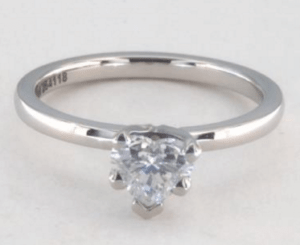 Well, there’s one – propose with a Heart Shaped Diamond! There's no over the top with this cut! It's the ultimate sign of love, so it’s just apt that the symbol of timeless commitment is shaped like a heart. Round cuts are the staple engagement rings, but if you’re eyeing heart shaped diamonds, then you or your lady must be hopeless romantics. This diamond shape is undeniably unique, glamorous, and at times exotic, because of its rarity. I have compiled the guide below to give you a gist of the heart cut, avoid poor choices, and find one that will save you money. Of course, without putting beauty and quality in jeopardy! Diamond hearts are painted with a dreamy and regal connotation throughout history! 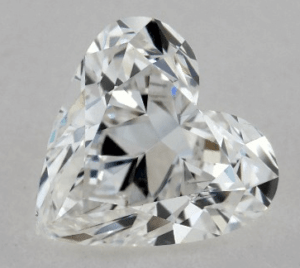 The heart shaped diamond was first known to the world in 1562 when Queen Elizabeth received a stunning ring with a heart-shaped diamond from Mary Queen of Scots as a sign of friendship. The beloved shape was also mentioned in a book written by Jean-Baptiste Tavernier in 1655. He’s the one who found the world-renowned Hope Diamond in India and then brought it to France. Today, modern women are just as fascinated with this diamond cut. 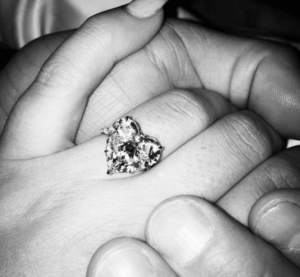 Some of the most talked about heart shaped diamond rings belong to pop icons Lady Gaga and Nicki Minaj. 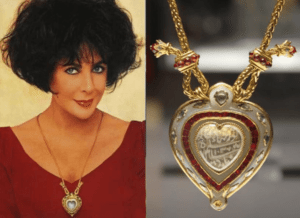 But the one that rules the list is Elizabeth Taylor’s Taj Mahal – given to her in 1972 by Richard Burton for her 40th birthday. It’s the supreme heart diamond radiating sheer elegance! Heart shaped diamonds may not be as rare in this age, but they’re still hailed as the most expensive diamond cut. Supreme precision and masterful shaping are needed to sculpt the rough into a symmetrical heart. This is where real the work comes in! The brilliant heart can exhibit superb fire and scintillation if it’s well cut. But in reality, most heart shaped diamonds possess poor cut, symmetry, and polish making them the most difficult to buy. As you know, cut grades are only given to round cuts. There are no such grading assessments created for fancy shapes. But don’t falter. I have prepared the following parameters at your disposal. Please note that this is only for reference and seeing the diamond under a loupe is definitely a must! 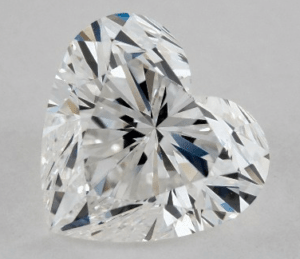 Being one of the most complex of cuts, a master cutter is trained to assure that the round edges of the heart shaped diamond are proportioned and separated by a distinct cleft. Since optical symmetry should be your priority, pick a diamond that possesses perfectly balanced arches. And to avoid the bow-tie effect which is common in fancy shapes like oval and marquise, do not solely rely on your grading report, have your diamond inspected as well! And of course, a heart wouldn’t be a heart if the two halves are not identical. Trained experts evaluate a diamond’s symmetry through a 10X magnification loupe. They look for imperfections such as misshapen lobes, off-centered table, bulged or flat wings, and undefined clef and point. The one on the left exhibits overly rounded wings, while the one on the right has a protruding lobe. Both of these stones are not considered good buys. So, if the flaws above are on the diamond you’re looking at, simply skip it as you'll only be wasting time and money. Although a lot of heart shaped diamonds range from narrow to plump, and the length to width ratio of a classic heart cut is 1.00, your preference is all that matters! As indicated below, I would recommend 0.95 to 1.05 to truly exhibit the diamond’s silhouette. However, heart shaped diamonds set in a solitaire ring may need a wider cut with a length to width ratio of .85 to 1.00. The same goes if you prefer a longer or narrower heart diamond, especially if you put it on a pendant; you may opt for a larger length to width ratio. Do know that size is particularly important when it comes to stones with unique shapes. A 0.50 carat heart cut would seem fine under a loupe, but in real life, it will look like a typical round cut when set on a ring. It’s a shame if you wouldn’t be able to enjoy its beautiful outline because it’s too small. 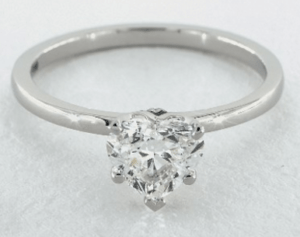 And even if you purchase a slim band, the prongs of the ring will only cover the diamond’s shape. Four-pronged settings are required for most heart shaped diamonds, and sometimes, a fifth prong is included to protect the point further. Although, some prefer the bezel or three-pronged setting to accentuate the shape of a smaller heart cut diamond. Since the body color of a heart shaped diamond is pretty evident near the tip, I would recommend a G color to make it face up white. On the other hand, diamonds more than one carat would look more icy white if you opt for an F or a higher color grade. Now, if you prefer a warmer tone or if you’re pairing your diamond with a yellow gold setting, H-K color grades will do just fine. 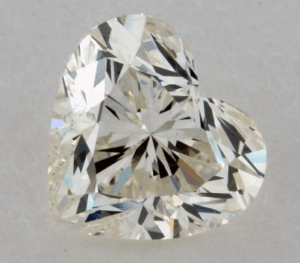 Given heart shaped diamonds’ cutting technique, impurities become more noticeable. So, if you want an eye clean diamond, stick with the VS2 grade, or higher if it’s bigger than .50 carat. 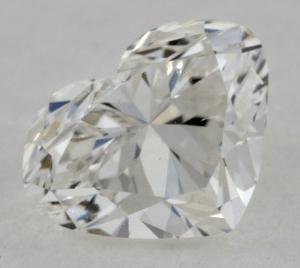 You can trust top diamond labs like GIA and AGS when they bestow a clarity grading. Nevertheless, eye-cleanliness is subjective. 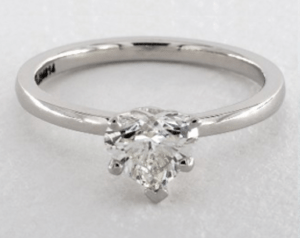 Even though I would always offer the most affordable eye clean stone, you might be more in favor of a flawless diamond simply for purist preferences. That’s why it’s important to view the diamond under magnification may it be displayed online or in a brick and mortar store. 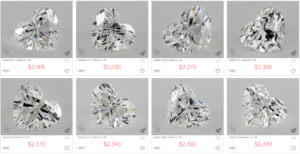 Of all the online diamond shops today, I find James Allen’s diamond display technology very suitable for new age diamond hunting. It’s currently the best when it comes to HD imagery and high-tech browsing tools. Check out their heart shaped diamonds here and see for yourself! At the end of the day, the crucial feature you need to look out for is the quality of the cut as it's what make or break the brilliance of the gem. Remember the tips above when shopping for heart shaped diamonds so that you could maximize your budget and let the romantic cut live up to its name!